It's been way too long since I've done this. But, now feels like the right time to do it again. Having a day off and zero motivation to actually do anything is a very dangerous combination. I mean, I've had three days off this week and accomplished absolutely nothing whatsoever. Seeing as today is my last day off until I go back to work tomorrow, I need to at least do something. Clea the apartment? Play with the bunnies? Paint a portrait? Nah. 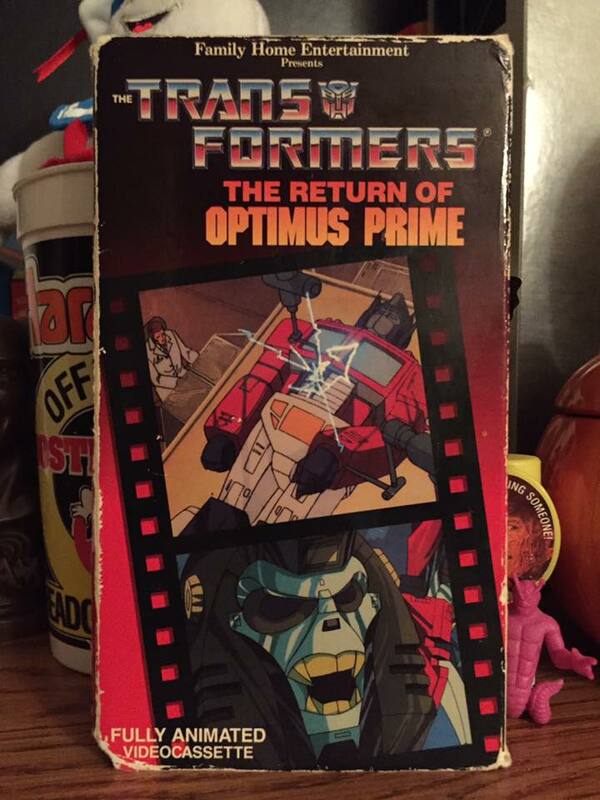 I know what I need to do: A VHS MARATHON! Being a huge fan of anthology series, I've always meant to check this show out, but never could get a hold of the episodes themselves. I even missed the reruns on SciFi Channel when they'd be aired back in the day. But, thanks to a fateful trip to the flea market, I was able to score this tape featuring two episodes. And I am very happy I finally found it. Within the first episode, I was sold. It's like a Tales From The Darkside companion piece with a monster of the week aspect. If these episodes are any indication, it's my goal to score more of these. I mean, I'm not gonna be able to drop 50 bucks on the complete DVD set but if I can score more of these, that'll satiate my appetite for now. Ooooooh yeah! 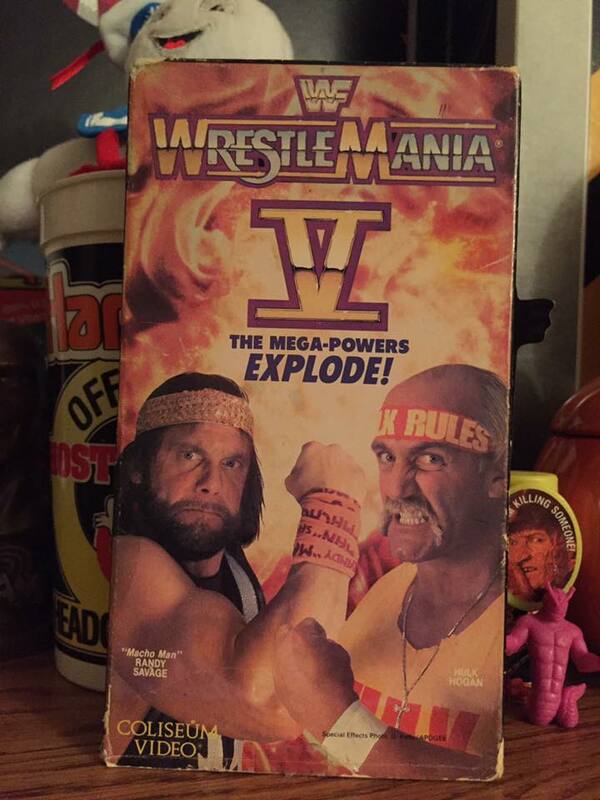 Wrestlemania 5 is regarded as a very unpopular show amongst wrestling fans, but I gotta be honest with you, I dig it. I mean, yeah there's some real stinkers on the card but for nostalgia sake, it's a nice trip down memory lane. It was at a time when WWF was still the number 1 show in town and Hulk Hogan still was the king of the world. 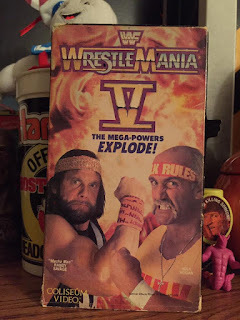 Plus, look at all the all-stars on the card: Randy Savage, Demolition, Big Bossman, Ted DiBiase, Arn Anderson and Tully Blanchard, The Ultimate Warrior, The Rockers, Jake The Snake Roberts, Andre The Giant just to name a few. It'll send you back to your childhood pretty darn quick. Ok. Time to confess: I've never actually seen Labyrinth. Yes, I know. That's a crime punishable by being heckled. I get it. My fiancée Laurie has tried to get me to watch this for years and years and really chipped away at me to the point that I've finally given in and picked up the VHS at a thrift store. Now, I haven't popped it in yet but I'll be waiting for my lady to get home to watch it after she gets home from work. 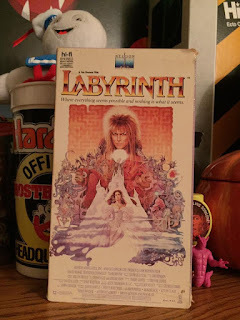 I like David Bowie and love Jim Henson's creations so to be honest, other than straight up stubbornness, I don't know why it's take me so long to watch this.But I'm excited to see it. I'm already sold on Dance Magic Dance and watching David Bowie kick around goblins. You guys remember when Optimus Prime was killed off in that amazing Transformers The Movie? 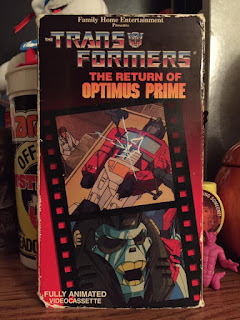 Well, depending on what release you ended up watching, there was a teaser at the end that revealed Optimus would come back later. They delivered in season 3 and by that point, the series had gone off the rails just became insane every episode. This episode was no different. The highlight was a red plague that caused everyone to hate each other. Um. Yeah, that was something to see. A bunch of Autobots fighting each other and even dropping the line "I'm a pepper. Don't you want to be a pepper too?". On top of that, Stan Bush's "The Touch" is used in the final battle scene. Bumblebee is given a new paint job and called "Goldbug". Rodimus Prime reverts back to just being Hot Rod. That's just a few things that they stuffed into this weird two part event. Which, at this time made sense. GI Joe was getting more and more ridiculous so Transformers followed suit. It's a pretty fun tape to watch and I'm sure the "FHE" logo at the beginning helps even more. 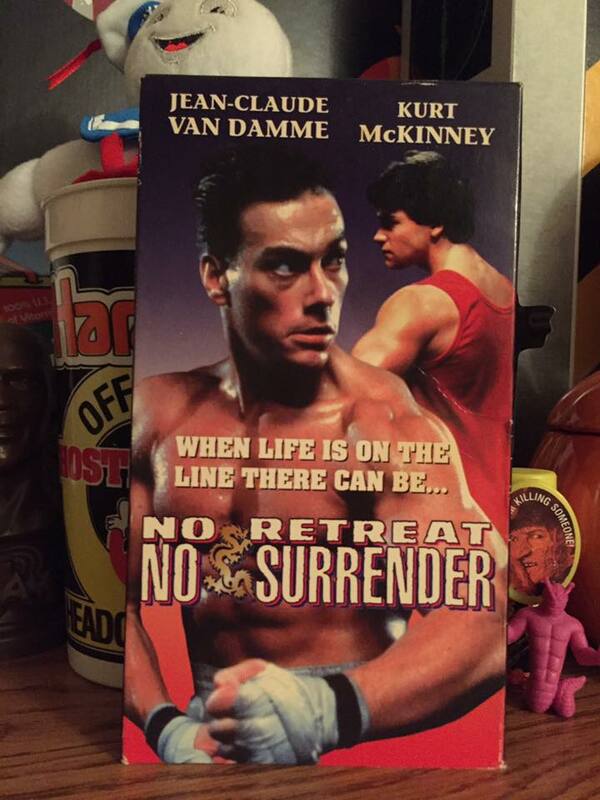 What better way to end this marathon than with a movie about a loser named Jason who invokes the spirit of Bruce Lee to take on Jean Claude Van Damme? No I'm not joking. This actually happened. Stop laughing. This movie is amazing for all the wrong reasons. Mainly due to the terrible karate "action", terrible dialogue, bad camera work, or the best friend of the main character, R.J, rapping terribly, and being picked on by the chubby bully or the fact that RJ actually eats ice cream and sits on the crotch of Jason while he works out and does pelvic thrusts. No, please don't make me post this. Stop. This movie has apparently, not surprisingly, gone unacknowledged by the Bruce Lee Estate due to their unauthorized use of his name and image. One can't blame them for that. 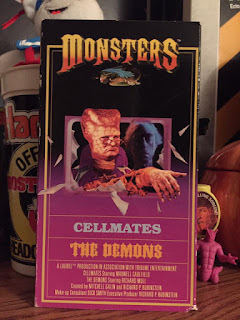 It's a hot piece of garbage but it's a FUN hot piece of garbage and if you can't find the VHS, Umbrella Entertainment released a fantastic bluray release, that you can pick up for cheap. It's worth it. Trust me. Awkward training montage and all. So now that I've assembled a great vhs marathon, it's time to crawl into bed and actually press play. Yeah, maybe I should go to the gym instead, but uh...tomorrow? 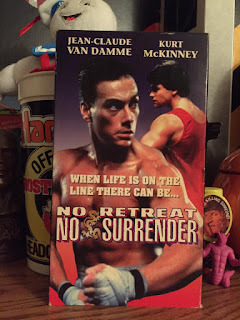 Check out my previous VHS Marathons: here and here. This collection makes me sweat. Forget the gym.